When we first arrived to Kansas, at the end of July, we found out our house would not be ready until the end of August. This meant we had to stay in an extended-stay style hotel for several weeks. While I was grateful that the hotel had a stove and oven, two of the eyes on the stove did not work and the oven was lacking any temperature regulation. To say the least this made for an interesting month and a half in regards to cooking. As soon as we moved into our house fall weather arrived in Kansas, which had me itching to bake something in my new oven (that works properly). 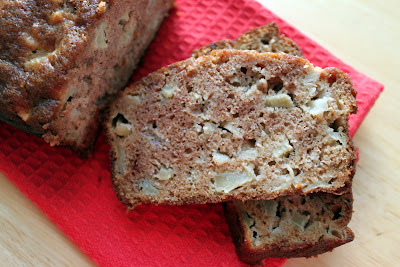 Typically I would have turned to my favorite banana bread recipe, but this time I wanted something different. Apple bread is what came to my mind. I love apples in almost any form and this bread is no exception. 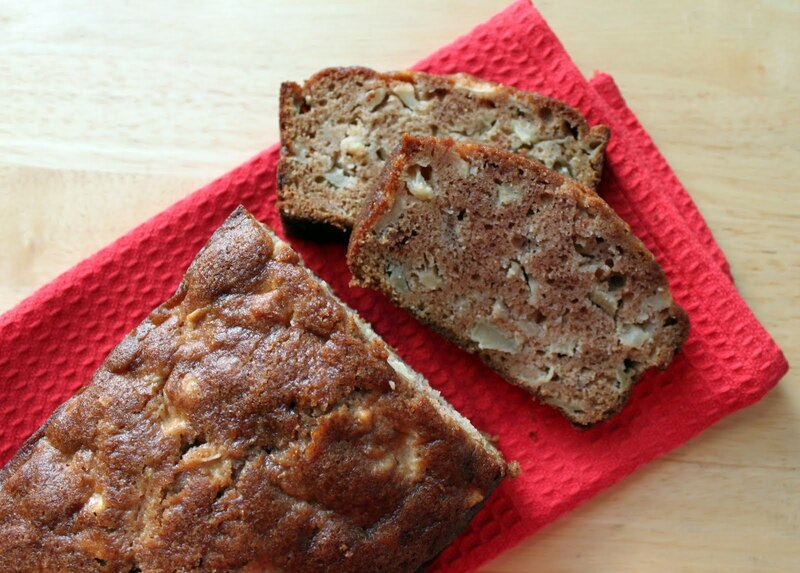 There are pieces of apple all throughout this bread which gives it a wonderful texture. The bread is so moist and flavorful that it leaves you wanting more. Be warned, if you are a batter taster like me, don’t taste this batter--if you do, you risk not having any left to make the apple bread--yes it is that good! Enjoy this as breakfast, dessert, or a snack. As fall is just beginning, I predict I will be making a lot more apple bread. Preheat oven to 350 degrees F. Spray a 9in x 5in loaf pan with non-stick spray. In a small bowl sift together flour, cinnamon, salt, baking soda, and baking powder. Set aside. In a separate bowl add sugar, applesauce, oil, eggs, and vanilla extract. Beat until well combined. Slowly beat in flour mixture. Using a spatula fold in apples. Transfer the batter to the loaf pan. Bake for approximately 40-50 minutes or until toothpick inserted in the middle comes out clean. Let apple bread cool in pan on wire rack for 5 minutes. After 5 minutes remove from loaf pan and place on wire rack to finish cooling.